Aside from the Brewers causing a blip on the radar, there has been nothing happening in baseball. Where are the juicy rumors that we know and love? Even baseless speculation has been mostly absent for weeks. Sure, pitchers and catchers report to spring training soon, so our baseball appetite will finally be fulfilled then, right? Meh. It’s been a slog of an offseason, folks. Let’s try to fill the void with a few under the radar, not rumored, and unlikely to be acquired infielders who could benefit the Yankees. How did I compile the list of forthcoming targets? Statcast data. When at a loss for finding something to write about during this barren offseason, playing around with Baseball Savant is quite useful. The gist of my rationale was to find infielders (i.e. second or third basemen, the team’s positions of need) who hit the ball hard frequently (greater than 95 MPH exit velocity) last year but were predominantly ground ball hitters (low launch angles; 10 degrees or lower results in a ground ball). The idea is that if these players can adjust their swings to lift the ball more frequently, there might be some offensive upside that didn’t come to fruition in 2017. Before diving in, let’s rehash the current status of the infield openings. Some combination of Gleyber Torres, Miguel Andujar, Ronald Torreyes, and Tyler Wade are slated to start the year at second and third base. Ideally, the top prospects, Torres and Andujar, make smooth transitions into starting roles at second and third base. If not, the Yankees are prepared to use of Torreyes and Wade to hold the fort in case either of the two top prospects need more seasoning (Wade also might need more seasoning!). Torreyes and Wade have their merits, but neither are suitable for everyday action for an extended period of time. Sure, the rest of the high octane offense can cover for their bats, but why do that if it’s not necessary? It seems like, at a minimum, the Yankees and Todd Frazier are dancing around what will be an inevitable return which at least would solve one opening. That would be a big help, undoubtedly, but there are a few off the beaten path alternatives that piqued my interest, whether they’re realistically acquirable or not. With a minimum of 50 balls hit into play all season, only four players hit the ball 95 MPH or faster at a higher rate than Diaz. Those players were Aaron Judge (55.0 percent of batted balls were 95 MPH or more), Joey Gallo (53.0 percent), Khris Davis (52.1 percent), and Alex Avila (51.3 percent). Diaz, a third baseman, checked in at remarkable 50.8 percent of his 122 balls hit into play*. On the other hand, he had the lowest average launch angle, 2.2 degrees, which explains his 59% ground ball rate, no home runs, and an unimpressive .244 TAv in 179 plate appearances during his rookie season. Diaz, 26, has always been a ground ball hitter, so it will be challenging to get him to lift the ball more often. Yet, given how hard he hit the ball last season, it’s easy to dream on the right-handed hitter finding more offensive production. *Note: League average is 33.5% of batted balls hit 95 MPH or faster. Though the identification of Diaz had nothing to do with his fielding, it happens to be one of his apparent strengths. Baseball America has previously admired his glovework and Eric Logenhagen already pegged him as a 55 fielder with a 70 arm. His FRAA numbers haven’t been impressive to this point, but scouts clearly like what they see. Though he’s primarily a third baseman, Diaz has played sparingly at second and has spent time in the outfield. I love Torreyes in a utility role as much as the next guy, but Diaz would be better. I think Diaz would handle an extended run at second or third better than Torreyes would, and would be a better bench option once Torres and Andujar are deemed ready to be regulars. Is Diaz attainable? He’s behind Jose Ramirez and Jason Kipnis on Cleveland’s depth chart, though he is slated to serve as the team’s utility infielder. Cleveland has a need in the outfield, and the Yankees have no shortage of outfielders on the 40-man roster. Maybe they would be interested in Jake Cave, though I’m sure they’re looking for a higher floor option. Just spitballing a trade proposal, that’s all. Let’s talk about the 24-year-old switch-hitting Diamondback shortstop. He was mediocre offensively in his first year with the team, hitting .260/.345/.392 in 255 plate appearances. Yet, his 6.7-degree launch angle indicates room for improvement, considering his that 35.6 percent of his balls in play left his bat at least 95 miles per hour. He makes plenty of contact, only fanning 16.9 percent of the time in his career, and regained his plate discipline last year (11.4 percent walk rate). That’s a promising offensive profile. Defensively, Marte is solid per advanced metrics, meaning that he should translate well to a role at second base, which would be his logical fit in New York. He spent limited time there in 2015 with Seattle (31.2 innings) and also played just over 11 innings at the hot corner last season, so perhaps there’s some versatility in his game. Like Diaz, Marte would replace Torreyes and eventually sit behind the likes of Torres and Andujar. However, the problem is that he’s slated to be Arizona’s starter at shortstop in 2018. 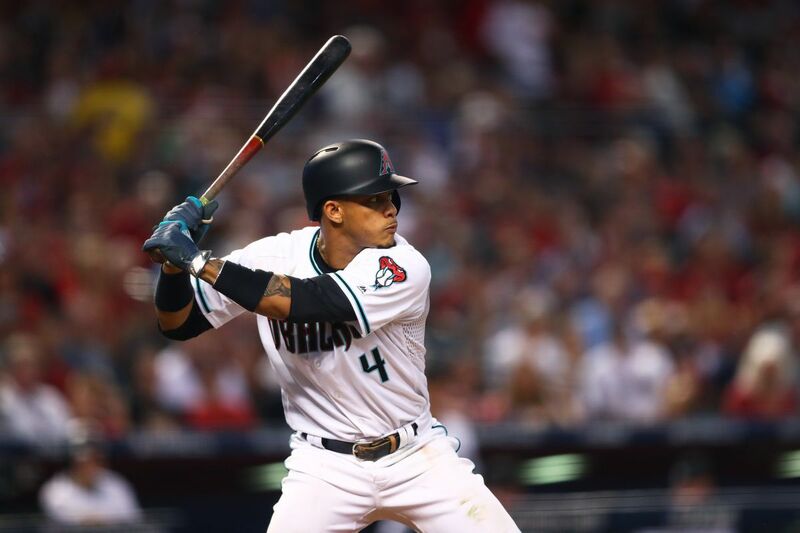 The Diamondbacks are looking to contend once again in 2018, and trading the starting shortstop doesn’t seem like part of their plan. Plus, Arizona picked him up just one year ago from Seattle, and at his age, it’s hard to imagine them eschewing him for other internal options like Chris Owings or Nick Ahmed. Maybe Freese isn’t so under the radar, as he has been the subject of some rumors this winter. So what, I’m going to squeeze him in here anyway. With Pittsburgh clearly in tear-down mode and the expectation that newly acquired Colin Moran will take over at the hot corner, Freese should be obtainable. Turning 35 in April, Freese has maintained average to slightly above average offensive levels for many years, and last year was no different. Though he lacked power, his .263/.368/.371 triple-slash was acceptable. And, given the combination of his low launch angle (8.5 degrees) and frequency of hard-hit balls (42.68% greater than 95 MPH+), perhaps a tweak could add some power to his bat. My guess is that coaxing a launch angle change out of a veteran like Freese would be more difficult than for a youthful player, but it certainly looks like an opportunity to extend Freese’s career. Freese is trustworthy in the field. Whether it’s DRS, UZR, or FRAA, he’s well appreciated at the hot corner. Unlike the Diaz and Marte, however, Freese is limited to the infield corners, so he could only be a placeholder for Andujar at the position. The 2011 World Series hero is owed $4.25 million in 2018 and his contract calls for a $6 million team option for 2019 (with a $500 thousand buyout). His luxury tax hit is higher than what he’s due, at $5.5 million, but that’s not too significant given the cushion the Yankees have available. As already mentioned, Freese is almost certainly on the trade block, and really shouldn’t be too costly in terms of prospects. It might only take salary relief and a low-level minor leaguer to get him. Compare that to what Todd Frazier or Mike Moustakas might cost on the open market, and it seems like a no-brainer to pursue Freese. Hello there, old friend. After trading Pirela to the Padres back in 2015, is it time for a reunion? The 28-year-old broke out in San Diego last year, posting an impressive .302 TAv in 344 trips to the plate. Despite a 9.5-degree average launch angle and 47.3 percent ground ball rate, Pirela had a powerful .202 ISO. Pirela’s always been a bat-first player, so it’s not a total surprise that he hit well in last year’s run-scoring environment. The fact that there might be some room for growth, or perhaps a tweak that can help maintain last season’s performance, makes him a tad more interesting. One of the big issues with Pirela is that he’s more of an outfielder nowadays. He logged nearly 570 innings in the outfield corners in 2017, while only playing a hair under 40 at second base, 30 at first base, and merely 6 at the hot corner. That seems to indicate that he’s not worth playing much in the infield defensively, where the Yankees would need him the most. His bat would certainly be a boost over Torreyes as the stopgap infielder, but his glovework might be an overwhelming negative. In all likelihood, Pirela starts the season as San Diego’s starting left fielder. However, that doesn’t mean he’d be impossible to acquire. The Padres won’t be in contention this year, so there’s no reason to make Pirela off-limits in trade talks (even if they were contending, Pirela isn’t a cornerstone). Even though there appears to be a potential swing change away from maintaining his 2017 hitting levels (or better), it’s probably too much to ask Pirela to be a regular second or third baseman as the prospects wait. Franco’s 2015 performance was supposed to cement him as a key piece in the Phillies rebuilding effort, but now it might be time for a change of scenery. Franco peaked at 52 in the Baseball Prospectus 101 top prospects in 2014, and now he looks like one of those fallen from grace prospects that the Yankees salivate over (i.e. Aaron Hicks). Franco’s meager .235 TAv was a big reason why he was sub-replacement level last season as a 24-year-old. Yet, 36.3 percent of his batted balls left his bat at 95 miles per hour or faster, which is comfortably above average. The 8.9-degree average launch angle is disappointing for a hitter with his strength, though he did overcome it to blast 24 homers. Raise his launch angle a few degrees and Franco can undoubtedly hit more than 30 home runs in this league. Interestingly enough, or perhaps frustratingly, he hits way too many pop-ups (16.3 percent career), which inflates his launch angle, if anything. Essentially, Franco hits too many grounders and too many infield flies, but not enough in between. Circling back to Franco’s positives: he makes a lot of contact, only going down on strikes 15.2 percent of the time last year. That’s likely a result of his aggressiveness, which is also why he hasn’t walked more than 6.6 percent of the time over the last two seasons. Franco struggles in the field and the advanced defensive metrics unanimously disapprove of his work at the hot corner. For all of the questions about Andujar’s defense, which may be unfounded in the first place, Franco is far more of a liability at the position. If it wasn’t for Rhys Hoskins or the newly added Carlos Santana, Franco would probably be destined for first base. Despite his shortcomings in the field, Franco might be an intriguing buy-low option that the Yankees seem to enjoy pursuing. Yet, it’s not like the Phillies are oblivious to Franco’s propensity to crush the ball, so if they can get his swing in order, there’s not much incentive for them to call it quits with the third baseman. Though he’s better suited at first base, or even designated hitter, I think Franco has a decent chance to rebound in 2018. Under normal circumstances, I think the Yankees would be all over a former top prospect like Franco, but given that Andujar’s profile might not be all that different (and perhaps better? ), it’s not a perfect match at this time. All of these players have their merits, but I think the salient point here is that the Yankees appear willing to run out a suboptimal lineup for the first few weeks of the season, or for as long as Torres and Andujar could need in the minors. There’s been talk of both of them being the starters to open the season, which is exciting, but it’s also necessary to temper our enthusiasm. They’re prospects, after all, and not everything goes swimmingly to start young players’ careers. Remember, even though we were spoiled by how quickly Gary Sanchez figured things out, Aaron Judge took his lumps to start his career. That’s why the Yankees are certainly in the market for infield help because even though Torres and Andujar are promising, there’s always a chance that one or both of them aren’t going to be significant contributors this coming season. It feels like Todd Frazier is just going to show up once spring training opens, which would be a fine and reasonable decision, but I can’t help wonder if one of the above-listed players would be an option with higher upside at a cost that wouldn’t break the (luxury tax) bank.